Earlier this month I attended the Wealthy Visionary Conference in Los Angeles and had the amazing opportunity to learn from Ridgely Goldsborough, co-founder of the WHY Formula. He coaches professionals worldwide to attract ideal clients based on their WHY. He shared nine common WHY’s that drive people to do what they do. Ridgely’s formula is to start with your why – first tell people what you believe so you can connect with those that believe what you believe. Next, tell them how you bring that belief to life. Finally, tell them what you do, what you offer, or what you have. This is how you attract, engage, and connect with amazing clients and customers. It’s the way we unite with others so we can make the difference we are called to make. 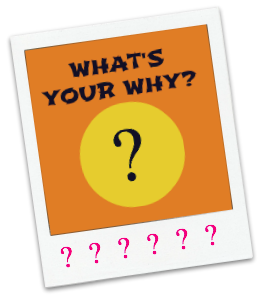 What’s your WHY for your business, your work, or your life for that matter? Do you know? It’s a critical question to answer. If you want to be successful in your business, as a coach, speaker, or in any work that you do, you need to know WHY you’re doing it. If your WHY is big enough, you can achieve any goal you want. My mission is to transform the world. It’s a BIG task that makes me swallow hard just thinking about it. But here’s how I see it. My “why” is YOU. I believe in your potential, and I’m deeply committed to supporting your success in whatever way I can. If I help you and you go on to help others, I, in turn, transform the world one person at a time. So, my WHY is to contribute to your higher purpose. I believe in the difference you make, and I feel compelled to be a part of it. My ability to coach and train you to the next greatest version of yourself is one BIG way I bring my WHY to life. One Degree Shift is a community of difference makers who are driven by really big WHY’s. This month, I taught them a formula for discovering their WHY and challenged them to spend some time thinking about the answer to the question: Why do you do what you do? Join our community and learn the formula for discovering your WHY and making the difference you’re called to make in the world. I would love to support YOU! This is such a huge topic for me. I am very passionate about helping women with their businesses. My struggle is figuring out my why. With your help, I am getting closer, which is fabulous! This community and the resources you share are definitely going to get me there. Ellen, you are closer to your WHY than you think! Your WHY is what drives you to do what you do. It’s just sometimes we’re too close to the answer that we can’t see it for ourselves. That’s why we need community. I’m glad you’re a part of One Degree Shift (and our Program Manager too)! You’re making a one degree shift to your higher purpose and your WHY while supporting others to do the same. Watch out world!! Thanks for sharing Ellen. I am glad also to be part of this community and feel safe and supported. It’s risky to find the right place to dig a little and find our own answers with the help of others. Cassandra, I just listened to the replay of the “what’s your why” community call. It was a breath of fresh air!!! The 9 Why’s by Goldsborough makes a lot of sense and you were able to demonstrate each one perfectly with the two coaching examples that you did. I believe what Simon Sinek stated about circle inside out starting with ‘why’, ‘how’, and finally ‘what’ makes extreme sense. I believe I have a good testimonial to his belief. I recently approached 6 business partners in my organization whom had stopped doing the business. I set up a meeting and my conversation with them went something like this, “I realize ‘life’ has impacted you, right? They said, yes. I then said, “I believe in you and your potential and your reason, your ‘why’ for starting the business in the first place was important to you. I Believe you can accomplish what you set forth and be extremely successful with Ambit Energy. The company has continued to do very well and you can turn a chapter in your life and start over and get this done and be successful. I don’t want to waste your time or mine so please let me know if you want to flip the page and continue forward with Ambit or stop doing the business? Every one of them told me they wanted to move forward. I loved this topic and am so glad I have joined your community and most importantly having met you. This was awesome material and I want to implement this immediately and I’m confident it will be successful. Thanks again for sharing this information and your expertise! Ilda, I’m so glad you were able to listen to the replay of the call! Everyone loved it. I’m glad you enjoyed it too. You are on track with communicating and leading your team. Speak to their WHY then tell them the WHAT and the HOW. And for you, Ambit is the what and the how your consultants will bring their WHY to life! Two thumbs up to you!!! I’m so glad you’re part of my community. After our initial call, I have spent quite a bit of time on my why and the old tapes that continue to tell me life is hard. I had a conversation recently with a new contact and she reflected back to me how many times I used the word ‘hard.’ It was eye-opening and I am working towards being brave enough to change that mindset. Uncovering my why in whatever business or project I am pursuing will help me savor the successes and appreciate the progress towards confidence and passion. I’m also excited to have someone working on an official logo for my massage business at http://www.bewellandrenew.com I built my own website but never had a ‘brand’ and will share it when it is finalized. Thanks Cassandra. I am so grateful for our connection and this community. I do believe it is making a difference. Sometimes we just miss those subtle shifts in consciousness. Staying aware and awake is important. Thank you so much Cassandra for working with me to discover my WHY! As a result, I feel like my eyes have been opened! I find myself recognizing when something bothers me about my job, it is because it goes against everything I believe in! I really do want things to be easier for everyone! I recognize that this is really something ingrained in me and I can’t change it, but I can change how I react to it. This will help me in my Ambit business as well. I know that I can help people make their lives easier by helping them do this business and give them choices! Cassandra, I came across your blog and thoroughly enjoy reading your messages. In particular I connect with What’s Your Why. My why is to mentor cancer patients to live well beyond a cancer diagnosis. My credentials are my 11-1/2 years surviving beyond an ovarian cancer diagnosis and running cancer patient support at an oncology practice. Like your story, last year the practice closed leaving me unemployed. Since then, I have been planning my career beyond the corporate world of a medical practice tied to a large hospital system. Your message is encouraging me to keep moving forward. I have a growing following of cancer patients eager to learn how I and others like me have rattled statistics by outliving cancer. I am developing my offering… soon to include a published handbook on outliving cancer. Thank you for writing your inspirational words that keep building confidence in women like me. Hi Janet! Thanks for taking the time to leave an encouraging comment. Yes! Keep moving forward. Your message and your work will make such a difference for so many others. Let me know how I can support you. I am so excited for you and your new launch to Learn, Connect, and Soar! My Why? Well, I am just one of those kind of people that people talk to naturally, tell their dreams and fears to. I love to use that as an avenue to make people see that they can reach those dreams. I am a great listener and interviewer! It’s my God-given talent, so I enjoy helping people discover their inner strengths and talents and help them get realize them to exceed their expectations. It brings me joy to see clients grow and learn how to make things happen! That’s my why! And thanks for asking! Be blessed and continue to make it happen for others!